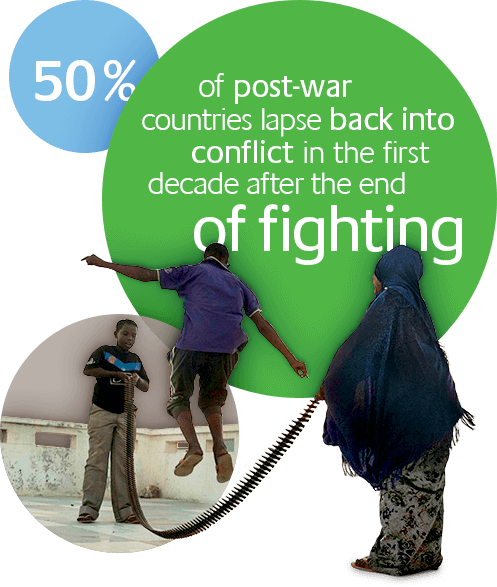 1 in 4 people live in countries affected by conflict or very high levels of criminal violence. The past two years have seen the highest number of global battle deaths for 25 years, record levels of terrorism and the highest number of refugees and displaced people since World War II. We convened 45 experts and practitioners from around the world to elaborate on state-of-the-art practices of reconciliation. The consultation was held in Colombia, a country now embarking on the journey of reconciliation itself. We shared insights on peace processes with African Union special envoys and mediators to learn from the best practices of truth commissions around the world. We conducted four case studies on experiences, successes and failures of reconciliation in the Democratic Republic of Congo, Guatemala, Northern Ireland and South Africa. These will help other countries steer their own peace processes. With its partner Interpeace, the Foundation is working with countries to strengthen their reconciliation processes so that peace is sustained and relapse into violence is averted.